Help! My Ex Won’t Abide by the Child Custody Order! Help! My ex won't abide by the child custody order! What should I do? Talking to them is a little bit like talking to a brick wall, isn't it? Yeah, I've been there before, too. 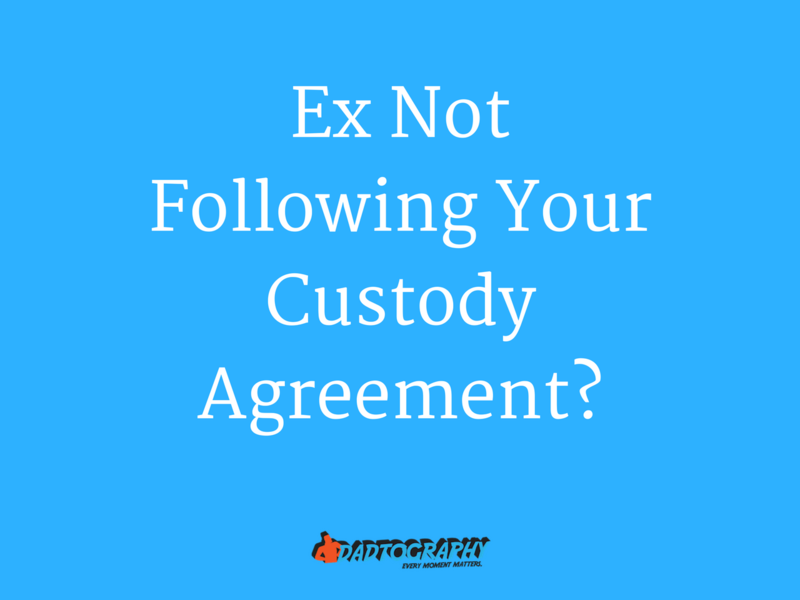 But what happens if your ex won't follow your custody agreement? What can do you do? I know your first reaction will be anger, and then frustration and eventually sadness (for your child, mostly). Try not to lose hope. There's always something you can do to make the situation better. Here are a few tips. Divorce is such a messy, emotional, painful situation. Unfortunately, it is also an indefinite situation. As long as you have children, you will forever be tied to your spouse. Sometimes that connection turns a bit ugly. Find out what you can do if your ex won’t abide by the child custody order or visitation rights. A child custody order gives one parent the right to make decisions for the child as the legal guardian. The non-custodial parent is usually granted visitation rights with the child. Unless there is a court order, visitation cannot be denied. My Ex Doesn’t Follow The Visitation Schedule. Is There Anything I Can Do? If your ex isn’t abiding by the court mandated visitation schedule, there are several things you can do. The action you take can range from mild to severe. Get your attorney involved. Ask him or her to send a strongly worded letter to your spouse. Remind the other parent there is a violation of the court order taking place. Inform him or her you are willing to take legal action and there will be penalties enforced if changes aren’t made. Involving a lawyer is a wise decision. First, your spouse will get a serious wake-up call if he or she knows an attorney is involved; this stances shows you are prepared to take legal action if need be. Second, the attorney can lend support and help you through the difficult situation. Call the police. File a police report to document the violation. Modify the visitation judgment. Ask the judge to include the exact time and place of each visitation. Ask to reschedule missed visits, include family therapy in the custody order or involve a moderator. File a motion for contempt of court. Ask the court for permission to withhold child support in exchange for the violation. Or, ask for attorney’s fees to be compensated as punishment. Sue for custody. If your visitations have been restricted so severely, it might be time to re-examine the child custody order. Unless there is a court order, visitation cannot be denied. If your visitations have been restricted so severely, it might be time to re-examine the child custody order. What Will Happen To My Ex if I Take Action? The action a judge takes will depend on personal preference, as well as the severity of the violation. However, it is definitely possible for the court to retaliate on your behalf. Punishment may come in the form of extra visitation rights, suspension of child support payments, and a change of custody. Perhaps the more important question to ask would be, "What will happen to me or my child if I don't take action?" What will the long-term effects be on you or your children? Yes, children are resilient, but subjecting them to a dangerous or detrimental situation will eventually take its toll. In most cases and states, you can't deny visitation with your children for lack of child support payment alone. Is It Ever Legal to Deny Visitation? Generally speaking, no; it is not ok to deny visits. The only way to stop visitation rights is with a court order. The most common reason why a custodial parent would try to deny a visitation is if the non-custodial parent is late with child support payments. However, visitation rights must still be upheld. If the custodial parent fears an unsafe visitation environment (alcohol or drugs are present, for example), the police should be involved. This is the best way to determine if the situation is or isn’t suited for children. The custodial parent should never take the law into his or her hands. Turning your child against your spouse won’t influence the judge’s decision – but it will make things more difficult for your child. If I Decide to Take Action, Is There Anything I Shouldn’t Do? When fighting against a child custody order or visitation violation, there are certain things you should not do. Otherwise, the court won’t validate your request. Don’t violate the court order. No matter what your spouse has done, don’t stoop to that level. Always take the moral high road. Don’t forget to document everything. Take careful notes of everything that transpires. Jot down what your spouse did and how you reacted. Don’t berate your spouse in the presence of your children. When possible, the judge will encourage both parents to take an active role in the child’s life. Turning your child against your spouse won’t influence the judge’s decision – but it will make things more difficult for your child. Don’t take the child away from his or her support system. Now is not the best time to move, uprooting your child from doctors, school, and friends. This will definitely mark you as the underdog. Don’t hesitate to hire an attorney. Sure, family law and divorce lawyers are expensive. But trying to battle intense, complicated, frustrating legal proceedings in the midst of an emotional crisis is not wise. Plus, an attorney has previous experience handling these types of situations. That expertise will really help your case. After a divorce, a connection will remain between spouses. While that connection can sometimes be strained, it is possible to ensure both parties get what is legally theirs. Time with your child is too valuable to risk; fight for your visitation rights. What do you think? Do you have any advice or experience you can give for those going through a difficult custody arrangement? Leave your comments below.